One night, a group of workers realises that their administration has organised the stealing of machines from their factory. They soon understand that this is the first signal of a massive layoff. Most of them refuse to cooperate during the individual negotiations and they start to occupy their workplace. So when the administration vanishes to their great surprise, they’re left with a half-empty factory. The closing of an elevator factory (one of many that close every month in the industrial outskirts of Lisbon) works in A Fabrica de Nada as a microcosm and a parable for dramatically exploring the textures and consequences of the feeling of impotence that most people felt during the years of austerity after the 2008 financial crash. Entrance free but booking here required. This is a one-day session presenting research methods for all new doctoral students. We will address a variety of topics that now concern Screen and Film Studies such as online research, dating mining, social media; live television; installation work; music videos, gaming, AV/PhDs, Production cultures, media industries, creative practice, and live cinema. The day include a panel on archives available for under researched or previously excluded cinemas and communities. The Event is funded by LAHP And CHASE, but all post-graduate students are welcome. Birkbeck Institute for the Moving Image (BIMI) is currently planning its programme of events for 2018-19. We welcome proposals from researchers and students working in any discipline or field across the Schools of Arts, Law, SSHP, and Science. We are very happy to work in collaboration with research centres and institutes at Birkbeck or at other institutions. All our events take place in the Birkbeck Cinema, typically on Friday evenings 6-9pm and Saturdays 10-5pm. We can show films in 16mm and 35mm, as well as a variety of digital formats. We are especially keen to foreground film and other moving image material that is rarely screened in public. BIMI Call for proposals 2018-19 and send it to bimi@bbk.ac.uk – the deadline for submission is the 18th of June. Looking forward to hearing about your ideas. 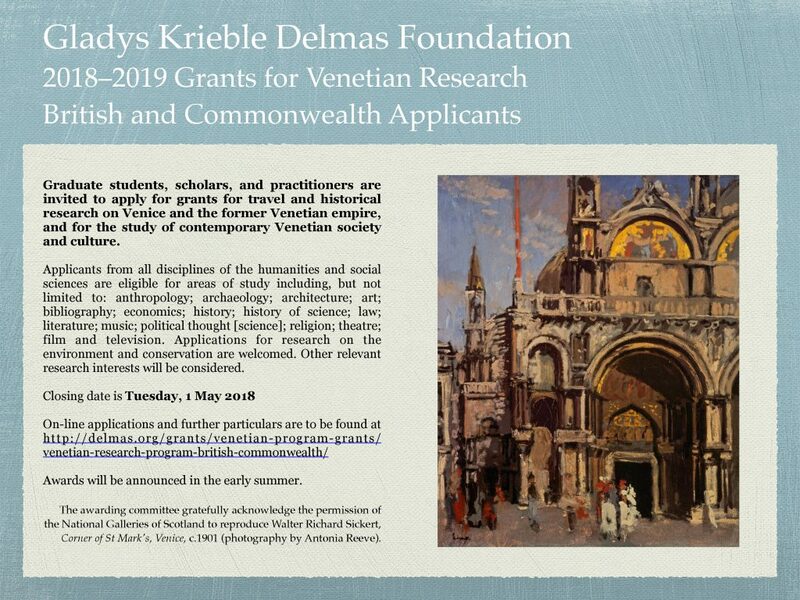 The Gladys Krieble Delmas Foundation – British and Commonwealth Committee – announces its 2018-2019 programme of grants for study based on travel to and research in Venice and the Veneto and other territories of the former Venetian Republic. Grants will be awarded for historical research on Venice and its empire, and for the study of contemporary Venetian society and culture. Applicants from all disciplines of the humanities and social sciences are eligible for areas of study including, but not limited to: anthropology; archaeology; architecture; art; bibliography; economics; history; history of science; law; literature; music; political thought; religion; theatre; film and television. Applications for research on the environment and conservation are welcomed. Other relevant research interests will be considered. The application deadline for the British and Commonwealth Programme is 1st May 2018. The awards will be announced by the early summer. Be citizens or permanent residents of Great Britain or the Commonwealth, and/or be enrolled for research at a British or Commonwealth university, and/or be permanent or affiliated members of a British or Commonwealth university. Experienced curatorial or conservation staff at British or Commonwealth galleries and museums are also welcome to apply. Have experience of research at graduate level or equivalent. If a doctoral student, to have fulfilled all doctoral requirements before completion of the thesis. Grants for the maximum amount – normally £5000.00 – are rarely awarded. Funding is granted primarily for transportation and accommodation, but additional research expenses may also be considered. Scholars who have already received and accepted a Delmas grant are eligible to apply for grants, normally for one month, to continue the work related to the previous grant, focused on Venetian material in libraries, archives, museums or galleries outside Venice. Applicants must not submit for funding for both grants within the same year. Applicants must notify the Committee immediately upon receipt of any other grant for research in the same area. Any person who has accepted three or more Delmas grants for Venetian research (regardless of amount or timing) will be ineligible for consideration for two programme years after the previous grant. Thereafter, the two-year hiatus continues to apply after each grant. The Foundation is now using a two-step online application form. Step 1: Register by providing your contact information and creating a login. Two speakers, Wouter Hessels, film lecturer and cinema programmer at the Brussels Royal Institute for Theatre, Cinema & Sound, and the film critic and author Louis Danvers, will each give a brief talk about contemporary Belgian cinema, and their presentations will be followed by a screening of King of the Belgians and a discussion chaired by Janet McCabe, director of the MA Film Programming and Curating at Birkbeck. Louis Danvers is a film critic living in Brussels, where he was born in 1955. He writes for Le Vif-L’Express, while also reviewing films for Telepro and for radio programs on RTBF. Co-founder of the film monthly Visions in the early 1980s, he is a long-time collaborator of the Royal Belgian Film Archive, and has written several film books, including Nagisa Oshima (Les Cahiers du Cinéma) and Brazil de Terry Gilliam (Yellow Now). He has directed documentaries about filmmakers, including Jaco Van Dormael and Abderrahmane Sissako. Under his real name, Michel Sordinia, he is the singer and songwriter of post punk cult band The Names, signed by Manchester’s Factory Records in 1979 and still active today. Wouter Hessels teaches film history, Belgian cinema and media studies at RITCS, Royal Institute for Theatre, Cinema & Sound in Brussels. He also teaches at Vesalius College (Free University of Brussels) and at the Royal Academy of Fine Arts in Antwerp. Since 2009, he has been the film programmer at the art house CINEMA RITCS in Brussels, and he also worked for the Royal Belgian Film Archive, and as a film expert for Flemish national television. He publishes regularly on art, media, film, education and politics, and he creates poetry-music projects, such as Brussels North–Brussel Centraal–Bruxelles Midi (2015-2016). He writes, teaches and performs poetry in Dutch, French, English, Spanish and Italian. An intensive 4-day course in all aspects of audiovisual production related to essayistic and research-led filmmaking. Students work in small groups and learn how to use widely available DSLR cameras and popular editing software to create professional looking and intellectually engaging videos. At the end of the course they complete a short training film. This gives them an opportunity to put their new skills to use immediately and experiment with the form of the essay film in a stimulating environment and with the support of the Lab’s team. Key elements of the course are: introduction to film theory, session on making an impact with research, tips on production management, hands-on skills in lighting set-ups, recording sound, and using cameras (Canon and Panasonic DSLRs, Blackmagic Cinema Camera), a supervised location shoot, editing theory and editing on Final Cut X. Our courses are designed to cater for a variety of levels of experience and to consider the different ways in which moving images can be used. An integral part of the training is discussing students’ research interests and how to make the best use of film in an academic context. We explore the conventions of documentary filmmaking but also talk about its alternatives, such as the essay film. The focus of this course is on films which combine an artistic form with an argumentative structure. We also engage with the concepts of visual methods of disseminating and conducting research in the humanities and social sciences. The training begins at 10am on each day of the 4-day course, and we aim to finish around 6pm. The cost of the course for Birkbeck students and staff is £300. More information about the lab can be found here: jarmanlab.org. Artists Joey Holder and Candida Powell-Williams both use animation to explore the relationship between digital and biological forms. Holder’s work considers the structures and hierarchies of the technological and natural worlds, and how these systems are constantly abstracted. Powell-Williams’ practice merges sculptural installations, performance and GIFs, using them to address the construction of identity through objects and memory. Following screenings of work by both artists, Holder and Powell-Williams will discuss hybrids, molluscs, fantasy and the interplay between the digital and the corporeal in their work. Joey Holder is a London based artist who received her BA from Kingston University (2001) and her MFA from Goldsmiths (2010). Her artistic practice and research spans video and multimedia installations both online and offline. Her work raises philosophical questions of our universe and things yet unknown, regarding the future of science, medicine, biology and human-machine interactions. Working with scientific and technical experts she makes immersive, multi-media installations that explore the limits of the human and how we experience non-human, natural and technological forms. Mixing elements of biology, nanotechnology and natural history against computer programme interfaces, screen savers and measuring devices, she suggests the impermanence and inter-changeability of these apparently contrasting and oppositional worlds: ‘everything is a mutant and a hybrid’. Connecting forms which have emerged through our human taste, culture and industrial processes she investigates complex systems that dissolve notions of the ‘natural’ and the ‘artificial’. GM products, virtual biology and aquatic creatures are incorporated into an extended web; challenging our perception of evolution, adaptation and change. By contrasting so-called ‘organic’ and ‘man-made’ substances and surfaces through a series of abstractions, she creates a world of manifold layers, none more unified or natural than the next. These hybridities may suggest a particular function or natural form but remain elusive through their odd displacement. Rooms, Berlin, Germany (2015); ‘h y p e r s a l o n’, Art Basel Miami, USA (2014); ‘Vestige: The Future is Here’, Design Museum, London (2013) and ‘Multinatural Histories’, Harvard Museum of Natural History, Massachusetts, USA (2013). Candida Powell-Williams lives and works in London. She graduated from the RCA, London in 2011. Selected exhibitions include: ‘Boredom and its Acid Touch’, Frieze Live (2017); ‘Tongue Town’, Museum of Modern Art, São Paulo; ‘Cache’, Art Night, London (2017); and ‘Coade’s Elixir’, Hayward Gallery, London (2014). In 2013 Powell-Williams was awarded the Sainsbury Scholarship at BSR, Rome. She is currently artist in residence the Warburg Institute London. For all those interested in using film in their research, the Derek Jarman Lab offers a short course in essayistic filmmaking. The dates are 10th – 13th November. editing on Adobe Premiere Pro. Courses are designed to cater for a variety of levels of experience and to consider the different ways in which moving images can be used. An integral part of the training is discussing students’ research interests and how to make the best use of film in an academic context. We explore the conventions of documentary film making but also talk about its alternatives, such as the essay film. The focus of this course is on films which combine an artistic form with an argumentative structure. We also engage with the concepts of visual methods of disseminating and conducting research in the humanities and social sciences. Regular thematic strands include ESSAY FILM, GUILT GROUP, DIGITAL ANIMATION, URBAN CHANGE, FRUITVALE FILM CLUB, CHILDREN’S FILM CLUB, PITTSBURGH LECTURE, and LUX ARTISTS’ MOVING IMAGE. We’re launching this year’s programme and inaugurating our new CINEPHILES strand with a screening of SHOOTING STARS (Anthony Asquith, 1928) in 35mm with live piano accompaniment – preceded by drinks in the Cinema foyer. Everyone is welcome and virtually all of our events are FREE! Looking forward to seeing you in the Cinema.